There are many annually returning festivals and events organized on the Big Island. Visiting these gives an unique local flavor to your vacation, even while (or maybe because) these events don’t draw large crowds. Although few visitors will come to Hawaii specifically to join this particular movie festival or that special culinary event, these festivals often make a fun day-trip, and are certain to leave you with good memories! You can use this section to see if there is an event during your stay on the Big Island that you don’t want to miss. skip down this page to read more about our list of all Big Island events. The two biggest events of the island that enjoy world-fame and do attract many visitors on their own are the biggest Hula festival in the world: the Merrie Monarch, and the Ironman World Champion Race. 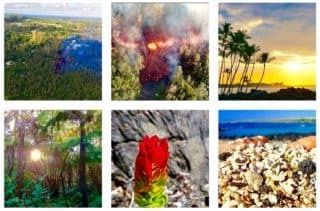 If you are visiting the Big Island during one of these two events, we recommend that you plan your accommodation and car rental well ahead of your arrival. The Big Island’s hospitality infrastructure gets somewhat overstretched during these events, which often leave the late planners without car or place to sleep. This is the most sought-after event on the Big Island! It is a one week-long hula celebration and competition with festivities including exhibitions, musical entertainment, arts and crafts fairs and the Miss Aloha Hula Competition and kahiko (ancient) and ‘auana (modern) hula competitions. Expect most hotels to be full at the island so plan ahead if you are interested in some world-class hula. For more info call 808-935-9168 or visit their website. Of course you can also see good hula dancing if you are on the Big Island while the Merrie Monarch festival is not on. See our guide to Luau and (free) hula shows for more information. There is no bigger day for a triathlete than the day of the Ford Ironman World Championship. It is the race that defined the sport as it came of age, and continues to be the defining race for any avid triathlete. It features 2.4 mi. swim, 112 mi. bike and 26.2 mi. run. Every year, tens-of-thousands of triathletes apply for a place but only 1800 get to participate to get that coveted title: Iron Man! For more info visit their website. You can probably find an event for every taste on the Big Island on our list of annual events on the Big Island. The events listed on that page only contain those events we think are most relevant to the visitors of our website. For a more complete list with more small and local events have a look at e.g. the event calendar on Konaweb or on the Big Island Now website.